For quantitative determination of D-glucose dehydrogenase enzyme activity and drug effects on its metabolism. • Fast and sensitive. Linear detection range (20 μL sample): 0.5 to 200 U/L for 15 min reaction. GLUCOSE DEHYDROGENASE (GDH) belongs to the family of oxioreductases, specifically those acting on the CH-OH group of donor with other acceptors. 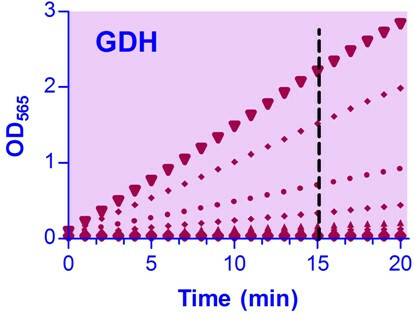 GDH participates in the pentose phosphate pathway. BioAssay Systems’ non-radioactive, colorimetric GDH assay is based on the reduction of the tetrazolium salt MTT in a NADH-coupled enzymatic reaction to a reduced form of MTT which exhibits an absorption maximum at 565 nm. The increase in absorbance at 565 nm is proportional to the enzyme activity. Applications For quantitative determination of D-glucose dehydrogenase enzyme activity and drug effects on its metabolism. Samples Biological samples (e.g. plasma, serum, tissue and culture media).